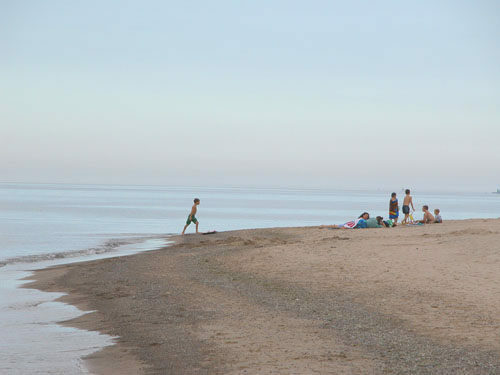 Grand Mere State Park is a 985-acre unit in Berrien County that lacks the amenities found in most other state parks along Lake Michigan, including a campground and even direct access to its mile of Lake Michigan shoreline. It attracts only a fraction of the visitors that flock to parks such as Warren Dunes or Hoffmaster. Yet from a naturalist’s point of view Grand Mere is one of the most inquiring set of dunes in the state, an area so ecologically diverse that it 1976 it was designated a National Natural Landmark by the U.S. Congress. The glaciers that scooped out the Great Lakes 10,000 years ago also carved out a number of smaller depressions along the western edge of the state, which evolved into interdunal lakes, ponds, and wetlands. At one time, this area contained a chain of five such lakes that were protected ecologically by a line of windblown sand dunes between them and Lake Michigan. Now there are only three, a result of aquatic succession. Today Grand Mere is a textbook example of the various stages of succession from aquatic communities to terrestrial. Beginning at North Lake, you can see how each lake is progressively disappearing, with open water first turning into marsh and then woodland swamps and closed bog forests, the fate of the former two lakes that lie south of the park. Almost 4 miles of trails form a loop through open dunes and the wooded areas of the park, but the only designated trail is a half-mile Nature Trail. The paved, handicapped accessible trail extends from the picnic shelter around South Lake, passing 10 interpretive posts that correspond to back of the park map. The rest of the trails are neither posted nor maintained. The most distinguishable trail extends almost a mile from a small parking area off Wishart Road to the west end of the Nature Trail. The Baldtop loop is a 2-mile hike around the park’s tallest dune and the most scenic walk in the park. Though short, it can be a workout because of the steep climb to Baldtop’s excellent views and stretches through the soft sand of open dunes. 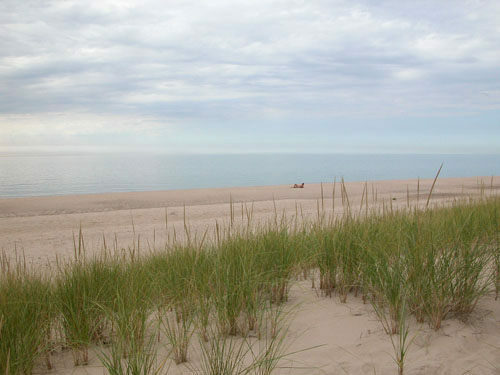 It also includes stretch along Lake Michigan where the beach is wide and somewhat private, even though you can view summer cottages at each end. The park attracts birders in spring and fall because it lies on a major migration flyway. Almost 250 species of birds have been sighted here, including large numbers of hawks that can be seen migrating on the east winds. Birders also spot migrating common loons, cormorants, a variety of waterfowl, herons and warblers and other songbirds in the spring. When there is sufficient snow, the park is popular with Nordic skiers, who enjoy an undeveloped, almost trailless, area to explore. Skiers can park at the end of Wishart, a half-mile drive from its junction with Willow Road. None of the trails are groomed, and there is no ski rental concession in the park. Grand Mere's main trailhead is near its picnic shelter and marks the beginning of a paved, handicapped-accessible trail. You skirt South Lake, though it’s almost impossible to see it through the trees, and at Mile 0.5 you reach the end of the paved nature trail at a V-junction. A sandy trail heads west (right) into the dunes for Lake Michigan. Continue southwest (left) to quickly come to another junction and your first glimpse of South Lake. The path to the southeast (left) continues west of the lake and in less than a mile reaches the end of Wishart Road at the park border. For the Baldtop loop follow the path to the west (right) as it climbs steeply. You climb the wooded base of a dune but soon break out in a sandy pass, with Baldtop to the north and a wooded dune to the south. Visible straight ahead is Lake Michigan. True to its name, Baldtop is free of trees at its 760-foot peak. The top is a 100-foot climb from here and a heart-pounding effort for most people. But from the high perch of the open dune you can see all of South Lake, including the vast wetland area that surrounds it. To the west is the wide beach along Lake Michigan, and to the south is the distinct dome of Cook Nuclear Power Plant. Descend back to the sandy pass and follow it west, the easiest and most common route to Lake Michigan. Reached at Mile 1, The beach is wide, 40 yards or more depending on the current level of Lake Michigan, and the water is shallow. 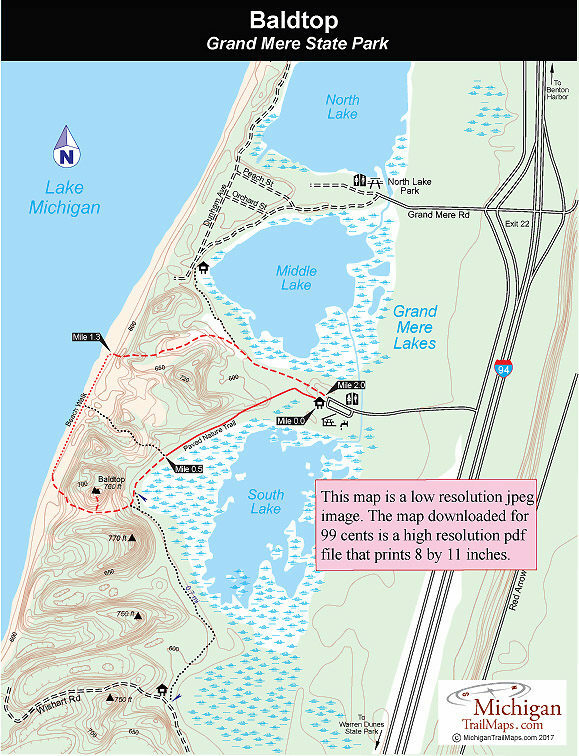 Head north from Baldtop, and at Mile 1.3 you’ll hike around the dune’s forested north side and arrive at a blowout area where a Grand Mere State Park sign has been posted. 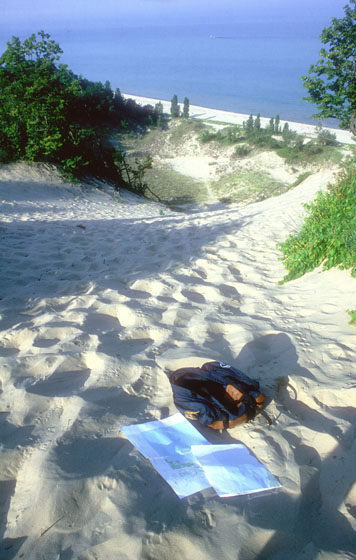 Hike inland and climb to the edge of the dune. To the southeast you’ll see South Lake again while due east is the wooded fringe of the open area with trails wandering through the trees. By heading northeast, you can pick up a wide path through the beachgrass that climbs around a distinct wooded dune and then enters more open sand on the other side. From here you can view all of Middle Lake, which has considerably more open water than South Lake. Hike down to the lake and find the sandy path skirting it through the low brush and grass. By heading east (right) you will return to the parking area, passing some great blackberry patches along the way. If you head north here, you’ll end up at the Grand Mere Road trailhead. Three roads lead into the park, but the official entrance is off Thornton Drive between Grand Mere Road and Willow Road. The posted entrance is a paved road that leads a half mile to a picnic shelter and a 60-vehicle parking lot. From here it is another half-mile walk to Lake Michigan through mostly wind-blown dunes. The shortest route to the Great Lake is from the end of Grand Mere Road, where there is a trail sign and parking for a half dozen cars. From here the beach is a quarter-mile walk over a few steep sand dunes. A state park annual vehicle pass (Recreation Passport) is required to enter Grand Mere and park at the trailheads. From I-94 depart at exit 22 and head east on John Beers Road, where you immediately come to the intersection with Thornton Road. Straight ahead John Beers becomes Grand Mere Road. Turn south (left) on Thornton Road to reach the park entrance or Willow and Wishart roads. For more information contact Warren Dunes State Park (269-426-4013). For lodging and additional travel information contact the West Michigan Tourist Association (616-245-2217; www.WMTA.org).